The Cisco SPA504G is a feature rich, 4-line IP phone that includes a 2-port Ethernet switch and Power over Ethernet (PoE). Supporting both SIP and SPCP, this phone is a good choice for small and medium sized businesses. Below you will find our review for the Cisco SPA504G 4-line IP phone, followed by sections on what's in the box, setup and installation. The Cisco SPA504G delivers great voice quality along with a solid user experience and if you are prepared, installation is quick and you can be making phone calls in a matter of minutes. The device is average priced for a VoIP phone, usually running just over $100 at most retailers. For the price and features, this is very reasonable considering many other devices in this price range do not quite boast all the extra options packed into this device, such as Shared Line Appearance (SLA) and up to 4 SIP registrations. Aesthetically, it is nothing special, as you can see at the top of this review – it looks like most professional phones. The console is very easy to navigate, the display is easy to read (it also features adjustable font size, ideal for those with less than perfect vision) and the buttons require no explanation. The handset is a little large but not too heavy so it works well at times when needing to prop between your head and shoulder. The web console is relatively intuitive so those familiar with the process of configuring such devices should not have any issues. Better yet, most systems capable of auto-provisioning the device can push configuration settings with a few (and sometimes, zero) clicks. The device usually does not package with a power supply but the reason for this is because it is Power over Ethernet (PoE) capable, which is a very nice feature to have but only if your switches and routers also support PoE. After all, this removes the need for wall power and cuts down on the number of wires that are required. As we just mentioned, the device does not come with a power supply, which may be a downside for some customers that do not have PoE switches or routers. This is fairly common these days unless purchasing a package deal from a supplier. Fortunately, it uses a standard connection so most 5V power supplies will work just fine. The base packaged with the device makes the phone sit at a somewhat awkward angle, meaning too perpendicular to the surface on which it sits. When this is the case, the handset seems to require a little more precision when concluding a call. Of course, there is the option to mount the base (two small screws will suffice) not to mention, a headset can be used in place of the handset. If using this device externally (i.e. outside of a network where an internal PBX resides or with a hosted provider), the device can register through a few different methods. For example you could reference a VLAN number assigned to your specific subnet in the configuration settings. However, such a method seems to produce weird issues at times. In such a scenario, just use the correct Fully Qualified Domain Name (FQDN) and avoid messing with VLAN settings altogether as certain network settings do not seem to successfully register. 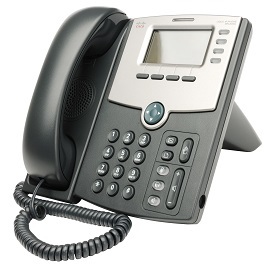 Reasonable pricing – slightly more than $100 for this high quality VoIP phone. The device does not package with a power supply. However, PoE is available. Several bonus features such as built in call forwarding, do not disturb, call blocking, music on hold and several others. 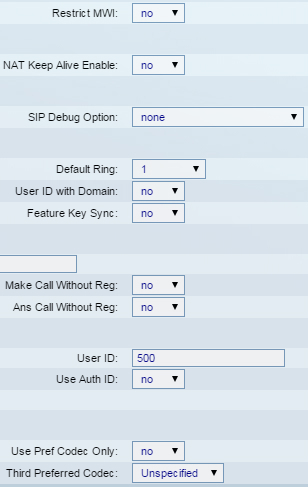 Device can register with up to 4 SIP accounts for versatile calling. Very easy to setup for most PBX systems whether internal or hosted. 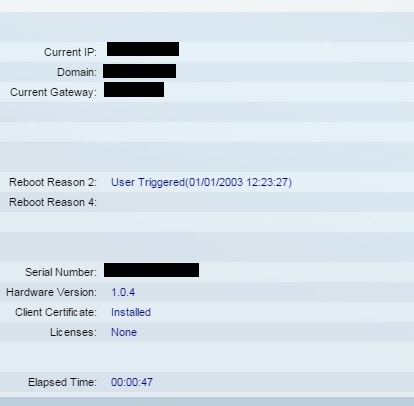 It is hard to find a truly bad Cisco product and this one is no exception. The device has many methods to tweak the settings thus allowing the phone to adapt to unique environments and preferences. The only issues with the device are very minimal – the stand is not quite ideal and like many other phones in the market, it does not package with a power supply. However, considering the overall functionality, this is a great device for its price. If you need a simple device for business calls, it would be wise to consider the Cisco SPA504G. The setup time really depends on your network configuration and the provider you are using. The following should provide a basis for proper, basic configuration in most scenarios. Here, I use an installation of an IP PBX that is hosted in a private cloud. Since my network connects to a Dynamic Host Configuration Protocol (DHCP) server, I simply plugged an Ethernet cable into the SW port on the bottom of the device and then connected a power supply. After a few moments, the device boots and initializes. After initialization is complete, press the button with the image on it that resembles a piece of paper, to access the menu. Scroll down to find the Network item and go into this menu. 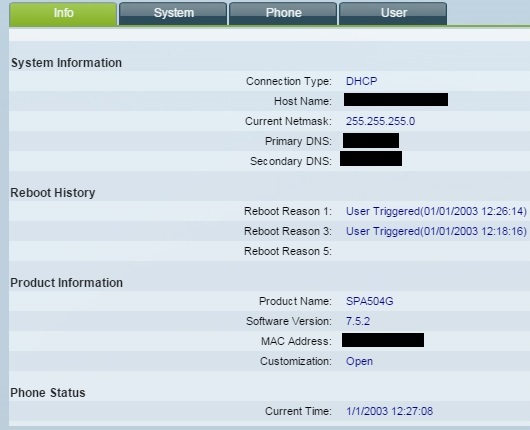 Here you will find the network IP address supplied by your DHCP server (for example, your router). Open an Internet browser and input this value into the address bar. By default, no user name or password is required. The screen observed in Figures 1 and 2 will be the first page to appear each time you open the web administration console. This page provides an overview of the phone configuration along with other information. Note I did not set the proper day and time. The first order of business should be to set the network parameters and a password. Click on the System tab to make these changes and you will see a page like that depicted in Figure 3 below. I left mine set at DHCP but in many cases, you may want to assign a static configuration. Enter these items into the correct fields and also apply a password. Select the Submit All Changes button at the bottom of the page when finished and the device will reboot. When the device finishes rebooting, provide the new password at the login screen (username should be "admin"). Select the Admin Login link in the top right corner of the page to complete the last couple of steps. First, go to any extension you will not be using by clicking on its tab. Change the Line Enable setting to no then go to the desired extension to register the phone. As seen in Figures 4 and 5, enter the IP address or the Fully Qualified Domain Name (FQDN) of your PBX or provider. 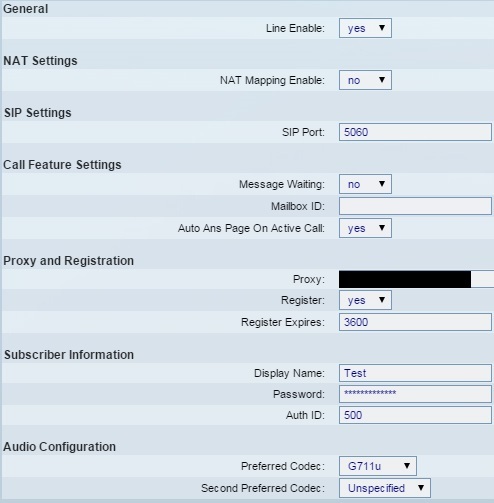 You will enter this in the Proxy field (for example enter 10.0.0.18 if this is the IP address of your PBX). Under the Subscriber Information section, enter a display name, the username or extension number and the corresponding password. Apply the settings by clicking the button at the bottom and that completes setting up the device. After the device completes its reboot, you should be able to make calls. Of course, there are many other features so pick through the menus and try them to see if they improve your calling experience. Worst-case scenario, you can always restore the phone to factory settings and start again. Cisco SPA504G reviews are listed in chronological order. The SPA504G is a great phone for basic phone usage. It probably would not be ideal for an executive or a receptionist -as it is light on features, but it definitely gets the job done for basic functions. The voice quality is superb. For me the online admin portal is why I continue to use this phone - the most important feature being the call history log. I definitely recommend this phone along with service from Jive. I have personally installed over 100 of these phones to date. Out all these that I deployed I haven't had to replace one. They have been running for over a year now and I have had zero sound issues. Note that abbreviations are very common on phones these days so you will need t understand teh standard ones when using this phone (e.g. xfer means transfer etc). If you want a feature rich solid phone with the Cisco name that is easy to deploy then look no further.